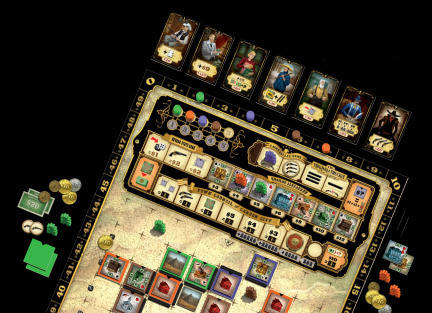 Carson City is a people placement game that I really enjoyed on my first play (initial review). Lots to think about and plenty of difficult decisions. I was looking forwards to my second play and was interested to see if it would offer new challenges and opportunities. Upon reading the rules prior to Spiel 09, Carson City sounded interesting and I pre-ordered it. I wasn’t disappointed either as the game delivered a close run contest with some very interesting choices. Together, but not co-operatively, players build Carson City. Each turn, players select a unique role and then spend their cowboy meeple (one at a time) to claim actions. Actions allow players to gain resources, buy buildings, hire additional meeple, and even gain victory points. However, actions only get resolved after players have committed their meeple. Plus, apart from the two default actions, only one player can perform each action.